Marchionne: "The strike is a very, very, very bad idea." ROME -- Caterina Gurzi, an assembly line worker at a Fiat car factory in Turin, Italy, has seen her share of crises over the past 32 years. The current economic slump tops them all; she even had to cancel her summer vacation. "We have never seen something like this before," said Gurzi, 55, who attended a demonstration today in Rome to protest Fiat's investment plans in Italy after a temporary layoff cut her salary. "After weakening our rights and worsening our working conditions, Fiat leaves us with an uncertain and precarious future." Gurzi and thousands of members of Fiom Cgil, the automaker's biggest union, walked off the job on Friday as part of a one-day strike. The protest reflects broader angst spurred by the European debt crisis, which has increased the urgency to boost productivity in a country where almost one-third of people between 15 and 24 years old are unemployed. A rally in Rome, part of the Occupy Wall Street protests, turned violent on Oct. 15, causing more than 100 injuries and 5 million euros ($7 million) in damages. Labor organizers are concerned CEO Sergio Marchionne will move production out of Italy, even after securing concessions from workers, as domestic sales slide and labor costs remain three times higher than in Poland. By striking on Friday, they increase that risk, Marchionne said. "The strike is a very, very, very bad idea," Marchionne told reporters this week in Turin. 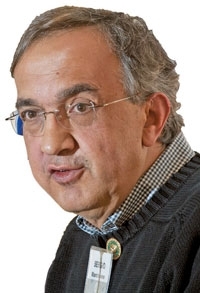 Marchionne also is CEO of Chrysler, where Fiat took control in 2009 as part of a U.S. government-sponsored bankruptcy reorganization plan. "You are telling someone who wants to invest in the country that you're not willing to participate and you are trying to impose conditions on the investments which you can't control." The carmaker's production in Italy is running regularly during today's strike, a Fiat spokesman said. The percentage of workers taking part ranges from 8 percent at the Cassino plant to 17 percent at Termini Imerese, he said. Fiat shares have dropped 30 percent this year, making the company the fifth-worst performer on the 15-member Euro Stoxx Automobiles & Parts Index. Marchionne doesn't expect Fiat to recover market share in Europe in the foreseeable future with Italian car sales hitting a 30-year low in 2011 and no sign that next year will be better, he said on Oct. 19. Underlining the decline in Italy, analysts estimate that Fiat's second-half operating profit will total about half that of Chrysler. Fiat reports earnings on Oct. 28. Fiat has said it will leave the country if a majority of workers reject its plans to make factories there more competitive by cutting production costs. Mario Draghi, head of the Bank of Italy, who will become European Central Bank president on Nov. 1, has pushed for a structural overhaul in Italy to end stagnation. Other Fiat unions favor the changes. Business confidence in Italy fell to the lowest level in almost two years in September. Prime Minister Silvio Berlusconi's government passed a 54 billion-euro package of spending cuts and tax increases in August to convince the European Central Bank to buy Italian bonds after the nation's borrowing costs surged to euro-era records. Rome's mayor reacted to the potential for further disturbance by banning marches, forcing Fiom to change its protest to a sit-in at Piazza del Popolo in the city center. Fiat plays a symbolic role in the Italian economy because it's the largest industrial employer. "If Fiat gives up on its challenge to grow in Italy and moves abroad, it will become a metaphor for a country that cannot be reformed, that has lost its hopes in the future," said Stefano Da Empoli, a Rome-based economist and chairman of Italy's I-Com institute for competitiveness. Marchionne succeeded in winning three concession votes from Fiat workers over the past 15 months, introducing new labor rules, including measures to limit strikes, curtail absenteeism and operate the factories on a six-day workweek. Those deals were spurred by the promise of a 20 billion-euro investment plan, called Fabrica Italia. Fiat, which will shut a factory in Sicily at the end of the year, has since postponed production of new models at its oldest plant in Turin by at least six months to the second half of 2013 and delayed the introduction of new Alfa Romeo. "The Fabrica Italia plan doesn't exist anymore," Maurizio Landini, Fiom's head, said at a press conference in Rome on Oct. 19. "There are no new models, market share is falling and temporary layoffs are increasing. Fiat workers, not its managers, want to keep the company in Italy." Yet workers don't have much to do because of slumping sales amid a lack of new models. Capacity utilization at Fiat's Italian plants was just 33 percent in the first half of 2011, compared with 73 percent at the carmaker's other European factories, according to a Sept. 20 company presentation. The 22,000 factory workers in Italy assembled 650,000 cars in 2009, while the 6,100 employees at its plant in Tychy, Poland, built 600,000 vehicles. Without taking into account differences in models or working hours, the Italian workers made 30 cars a year on average, compared with almost 100 in Poland. In addition to lower productivity, Italian workers cost 27.69 euros an hour, more than three times the 7.52 euros in Poland, according to data from German auto industry group VDA. Fiat can't take a "provincial approach" to production decisions, Marchionne said, adding that the fall in the Italian auto market since the 2008 peak is equivalent to losing demand for the output of an entire auto factory. "The central problem is that Fiat is very dependent on Europe and not relevant in growth markets, with the exception of Brazil," Stefan Bratzel, director of the Center of Automotive Management at the University of Applied Sciences in Bergisch Gladbach, Germany. "The next two to three years are going to be very difficult for Fiat. They have to get the costs down and Marchionne is well aware of that." The Italian union opposes the new labor rules aimed at making work hours and conditions more flexible. The goal of the changes is to end losses in Europe, estimated at 800 million euros a year, by 2014. In contrast to the tension in Italy, Chrysler reached a tentative agreement with its workers earlier this month. The deal, if ratified, will pay staff a record $3,500 bonus in return for hiring more people and investing $4.5 billion. In Italy, workers like Gurzi are worried their jobs will move elsewhere. Still, there may be a realization that something has to give to prevent the crisis from deepening. "Something is really going to change in Italy," said Michel Martone, professor of labor law at Luiss University in Rome. "People are starting to understand that there is no more time for ideological conflicts. It is time to move forward."